M2K Music School offers tuition on Piano, Keyboard, Guitar, Bass, Ukulele, Drums, Violin, Clarinet, Saxophone, Flute, Singing and Music Theory. Whether you are an adult or child, complete novice or experienced, M2K’s professionally trained and qualified staff offer you and your family the opportunity to play a musical instrument. During 1998 we were pleased to announce the installation of a complete Music Teaching Academy. Since then it’s become a well established business playing an important role in its parent company MUSIC 2OOO. Our music school set high standards and obtains excellent results, offering modern music tuition incorporating examination course material. We also work closely with various examination boards(including ABRSM, LCM, Trinity Guildhall & Rockschool). 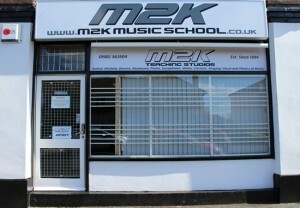 In 2008 M2K was awarded the status of Rockschool Examination Centre for the West Midlands and all surrounding areas.